After watching the Dictator, I had to go back and watch Sacha Baron Cohen's other films because funny movies rarely come out nowadays. His first movie basically had him as a tourist exploring America as he goes from one funny skit to another. This movie is one of those movies that can make me laugh no matter how many times I watch it. It contained one of the funniest scenes in American movie history that feature Borat and his sidekick in a naked battle. Some people would find Cohen's jokes a little offensive but that would depend entirely on the person. 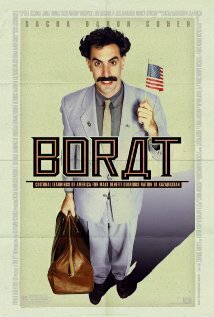 Borat's adventures are hilarious as he encounters different people from an etiquette coach to a bunch of feminists. All had their share of funny moments and Cohen really had all of us believing he really is from Kazakhstan. Whatever comes next after the Dictator, I will certainly go to the theaters for Cohen's next movie. He is probably the only funny guy in Hollywood right now. I hope Cohen would make another Borat and Bruno-style mockumentary film. I love how offensive they are.